One convenient download. One bargain price. 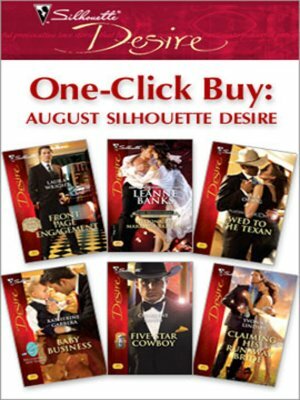 Get all August Silhouette Desire with one click! Emotionally compelling, sexually charged and romantically satisfying, these stories from Silhouette Desire will thrill and delight you with the power of love to transform and redeem. As powerful, ambitious, devastatingly attractive men wage a war wills with vibrant, warm-hearted, intoxicating women, they must learn a few lessons about betrayal and trust, pride and passion in order to find real meaning in life in the arms and hearts of the women they love. Find all this and more with six powerful, passionate and provocative stories from Silhouette Desire! Bundle includes Front Page Engagement by Laura Wright, Billionaire's Marriage Bargain by Leanne Banks, Wed to the Texan by Sara Orwig, Baby Business by Katherine Garbera, Five-Star Cowboy by Charlene Sands and Claiming His Runaway Bride by Yvonne Lindsay.